A couple of months ago, I collected the MediaCity line with Robert. At Pomona stop, we simply jumped off the tram, hung around the platform and then got on the next train out. At the time, Robert queried, "does that count?" Of course, it didn't. The rule of this blog has always been that you exit the station. If at all possible, you walk on to the next one, but if that's not possible then at the very least you pass through the ticket barriers and out into the street. It's been there right since the very first post, back in 2007, when there was still hope in the world. Pomona, therefore, had to be collected properly. I headed back there on a sweltering hot Monday and disembarked to find a full platform. This was a bit of a shock, as Pomona is in what experts call "the middle of nowhere". There were half a dozen revenue protection officers ready to check the hordes of people who disembarked the tram. And when I say "hordes" I mean "me". I eventually found the ticket on my phone (incidentally, in all my Metrolink travels, this is the first time I've had my ticket checked) and left the stop. Now all I needed was a sign at ground level to prove I'd actually been there. Not that I'm saying you wouldn't believe me; if I said I'd been to Pomona again and passed through the ticket barriers I'm sure you'd accept it, because you are kind and decent people. This was more for my completest, slightly manic frame of mind. But as usual, Metrolink had let me down. Not a single piece of signage with the name on it. It's like they don't want you to know there's a tram stop there. I was resigning myself to going back up to the platform to make an idiot of myself in front of the ticket inspectors when I spotted something unusual. It's a cast iron post, right in the middle of the cobbles, with Metrolink Pomona Strand inscribed round the top. I presume it's some sort of commemorative icon, perhaps to mark the opening of the branch, but there's nothing to indicate that (there's a plaque further down the line Tony Blair unveiled). And the use of Pomona Strand (the street the stop is on) - was that the original name of the stop? Whatever it is, it was a sign for the Metrolink right outside the stop, so it counts. The question was, what to do next? I could have just boarded another tram, but that seemed like a dull idea. Pomona's status as the spot where the new Trafford Park line branched off gave me an obvious idea - I'd walk along the route of the new line, collecting its stops before they've even been built. ...while on the ground, the landing point for the new tram ramp is coming together. The works sent me down onto the canal towpath, not one of those scenic canal paths that Pru and Tim pass on their narrowboats, but one with overgrown bushes and a smell of urine. The kind of canal path where people get pushed into the water, or stabbed. I was glad to rise up onto a cobbled street, where a sign informed me Pomona Strand was private property and there was no right of way. I wasn't feeling too welcome. The tram line will pass under the Trafford Bridge, but I was forced up to street level, to negotiate the traffic swinging off the roundabout. A giant LED screen flashed up adverts as I waited - girls in bikinis on holiday, laughing families, a six storey high bottle of fizzy drink. Over the road, and back down to canalside level for the first stop: Wharfside. This will eventually be an incredibly busy stop, as it's the closest one to Old Trafford. For now it's just a couple of lumps of concrete as the foundations for the platform go into place. I carried on along Trafford Wharf Road, passing office workers out for a lunchtime walk with their sandwiches. It's still in that halfway point between "thriving city district" and "industrial park"; there's office blocks, yes, but there are also workshops, and the Imperial War Museum sits right opposite a large grain silo. This is where the second stop on the line will be: handy for the museum, and also handy for ITV Studios. The tv people objected to the construction of the line as they thought the rumbling of the trams would disrupt filming. You'd think Audrey Roberts would be keen on a stop handy for work, but there you go. You can see their point though - the recent set extension means it rubs right up against the perimeter wall, with the new Weatherfield Police Station clearly visible from the street. The line veers away before it passes the front gates though, meaning Gail will be able to sleep without being too disturbed, and up Wharfside Way to the Village Circle roundabout. Here was where following the route of the line started to get difficult. Constructing a tram link is a major job, and it means significant disruption. Metrolink have concentrated on keeping cars flowing, which means if you're a pedestrian, you're sort of shoved to one side. To cross the roundabout I found myself being sent back and forth, over all sorts of temporary pavements, just to reach the far side. That'll be the site of Village tram stop. The name "village" implies bucolic living - countryside and duck ponds and tea rooms. It couldn't be further from the reality. Trafford village was a planned community for factory workers, laid out on numbered avenues. It never really took off. Unlike say, Port Sunlight, the homes were cheap and squalid, and built right at the centre of the industrial park, meaning pollution was everywhere. Most of the homes were demolished in slum clearances. Now "the Village" is a strip of shops for the local tradesmen - a chippy, a Greggs, a newsagent - and St Anthony's church, which somehow clings on. Past torn up streets and one-way systems. Signs warned motorists of disruption for months. I dodged through fences and across traffic lights, still blinking in sequence even though the roads they guarded were closed to traffic. I began to wonder who would be using the Trafford Park line. At its start and finish - the city centre and the shopping mall - yes, I could see users, but here in the middle was just acres and acres of sparse industry. There were no residents, and hardly any pedestrians. In my whole walk I saw a single other person on foot, a portly man who launched himself out of a row of trade units and crossed the road without looking. I suppose people need to get to work, but so many of the factories had parking and easy road access, I couldn't see many giving up their drive for the tram. Parkway Circle was even larger, and in an even bigger state than Village Circle. The trams will one day sweep across the centre of the roundabout to a park and ride, but until then it was a lot of churned up tarmac and men in hi-vis outfits. I did, at least, get my first glimpse of actual tracks, installed in the road surface already. After what seemed like an hour of walking, I managed to get round the roundabout and onto the bridge over the canal. The tram line will cross here on a new bridge. Hopefully they'll upgrade the footpath at the same time, because right now it's just a wedge of pavement next to choking fumes. I headed under the flyover and walked into the outskirts of the Trafford Centre complex. There was a bland Holiday Inn, then the site of the next stop: Event City. The attraction that gives it its name is a series of large white boxes, ready to host whatever corporate beano is required - "from yoga retreats to triathletes", the posters promised. Excitingly, there were more rails here and then, as I approached the Barton Square section of the shopping centre, I actually walked across tramlines laid into the tarmac. I was now approaching the terminus of the new line and - let's be honest - the main reason it was going to be built: the Trafford Centre. 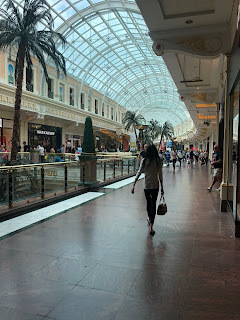 Sorry, the intu Trafford Centre, as it has been optimistically rebranded; there isn't a single person alive who calls it this. I'd never actually been to the Trafford Centre. Opening in 1998, it's the second largest shopping centre in Britain (after the MetroCentre in Gateshead) and it had a reputation in the North West as the hub of everything worth buying. People talked about it in excited tones; entire days out were planned to get the most of it. I'd not avoided it, I'd just never got round to going. They are, let's be honest, not that interested in people who don't have cars. Pedestrians can't load their arms with shopping, and there's only so much you can carry on the bus. You need a car to be able to take proper advantage of the shopping opportunities. Which is, of course, why it's taken them twenty years to send a tram line this way. Some claim that there should've been a tram line here on opening, but the developers backed out of paying for it; I certainly can't believe you'd get away with building such a huge shopping centre without some kind of fixed rail link today. I wiped away the worst of the sweat and entered the centre where tram passengers will be deposited: by Selfridges. Immediately there was the sweet needles of ice cold air conditioning, a cool breeze sweeping over me and chilling me delightfully. After an hour of walking in the midday sun, it was unbelievably welcome, and I wandered through the store in something of a daze. Finally I emerged on the far side, in the mall itself, and an enormous grin spread across my face. I'd known that the Trafford Centre had lofty ideals. 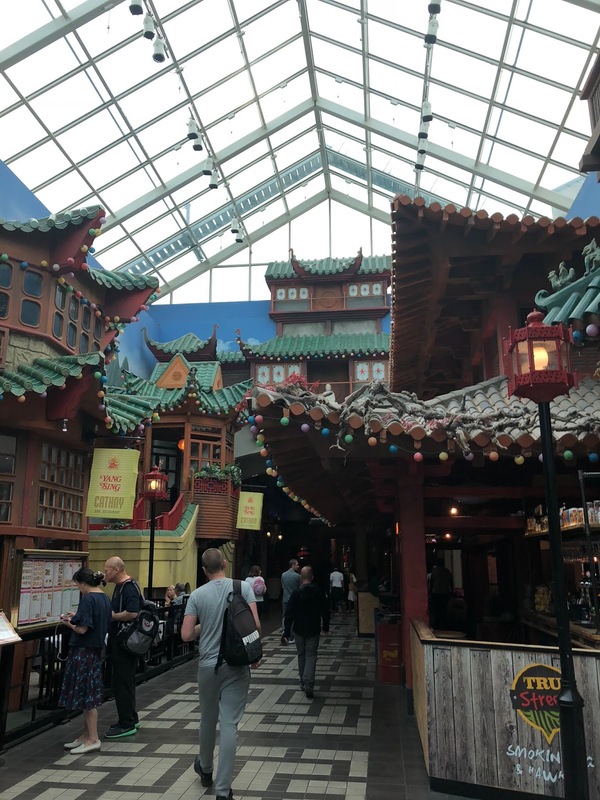 It wasn't just a shopping centre, it was an experience, and they'd spent a considerable amount of money constructing it. What I hadn't realised was quite how naff it was. There is a certain kind of person who keeps their television in a cabinet. You don't get them so much now TVs are a centimetre thick and can hang on the wall, but when they were bulky and deep, the cabinets were common. People had a room that'd been designed to look a particular way, and a glass and plastic cube didn't fit in with the design. From the outside it's designed to look like a Chippendale; dark wood and brass hinges, concealing the electronics inside. Look closer though and you realise that the design of the cabinet is modern too; it's not just a box, it's got a special shelf so you can pull the TV out, and there's a cable tidy space, and a spot for your satellite box. It's as modern as the bunch of electronics you're trying to conceal, and probably not as well made, and to be honest it's just a load of faff because every time you want to watch EastEnders you have to open it all up again. It's pointless kitsch. The Trafford Centre was designed by and for people who kept their televisions in cabinets. It's a temple to shopping and commerce and naked, unbridled, consumerism, but that's all a bit vulgar. So they've designed it to look like a Venetian palace. 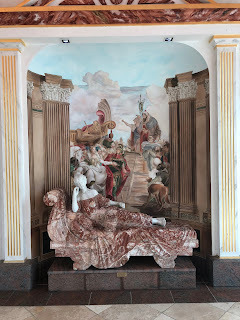 It's covered in marble and frescos; there are ornate pillars and statues. 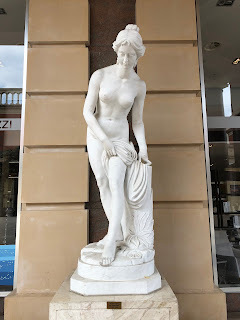 Everything is designed as though it is a classy, elegant place of beauty while at the same time being a place where you can buy trainers and computer games and perfume and anything else you could possibly want. It's for people who really like spending money as a hobby but want to pretend they don't. It's for people who think the Arndale is common because it's got strip lights and white walls. It's not all Venetian. There are two avenues of restaurants. One is New Orleans themed, one is Chinese themed, and they lead up to the food court and cinema. The food court is just... I mean, let's be kind and say it's "ocean liner" themed, and not based around a certain ship which sank in 1912 and was the subject of a very popular film around the time the centre opened, because that would just be too tacky. 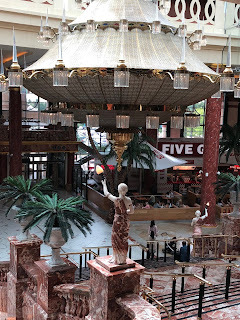 I headed for the "Grand Hall" at the rear, where a large set of steps and a chandelier guided me down to a Costa Coffee and a Five Guys. I got an iced drink and sat down. The weird part is, it's simultaneously over the top and not over the top enough. 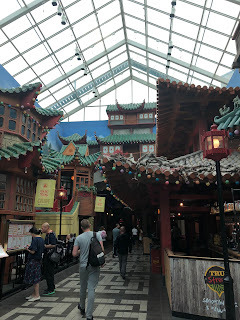 This is, after all, just a shopping centre; it doesn't need all the gubbins. MetroCentre manages without it. So does Meadowhall. They're just long avenues with shops and that's fine for me. The shops are the main attraction. 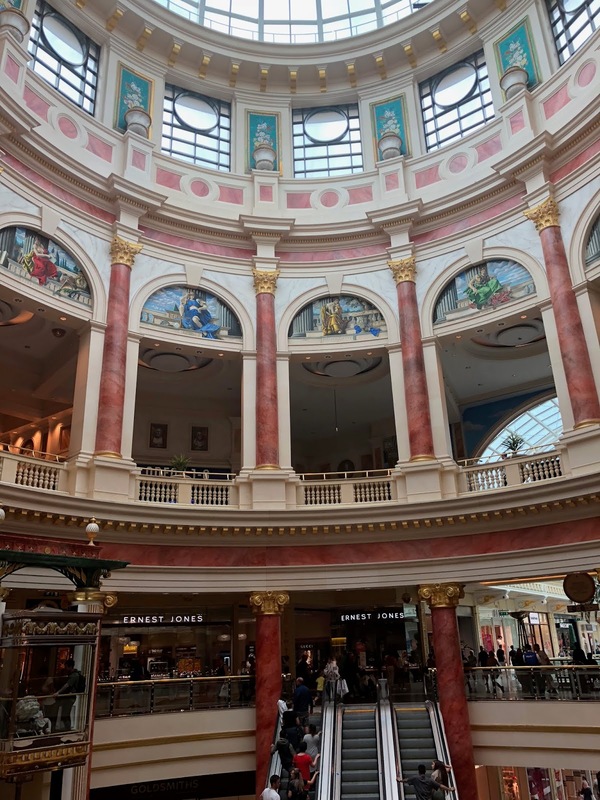 At the Trafford Centre, they've spent a huge amount of money to try and make the shopping centre something more. But they haven't gone far enough. As I walked around, I was reminded of Las Vegas. I went there years ago, and I stayed in a hotel that was King Arthur themed. I had breakfast in a pyramid. I had dinner under the Eiffel Tower. You could take a gondola ride in a recreated Venetian canal, or watch a volcano erupt (three times a night). It was huge and ludicrous and over the top. 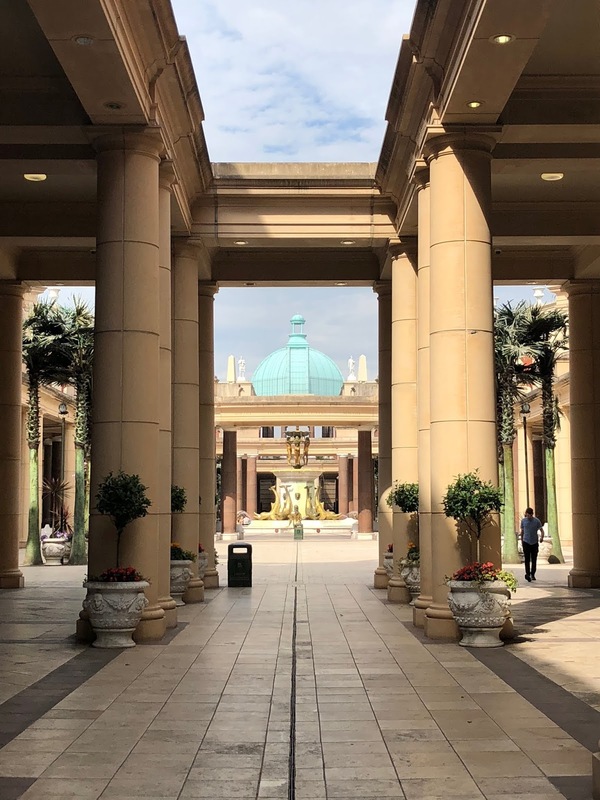 The Trafford Centre is big and awful, but it's not big and awful enough. It's not a massive ridiculous experience. It's a shopping mall with a bit of marble. It's a few decorative touches. It's a cabinet around a telly. I took the footbridge across to Barton Square, an extension opened in 2006. This was to have been the homeware quarter - a district of high end furniture retailers. It was a flop, and after an attempt to make it more of a tourist attraction with a Lego experience and an aquarium, the owners have admitted defeat. It's going to be turned into a giant Primark. 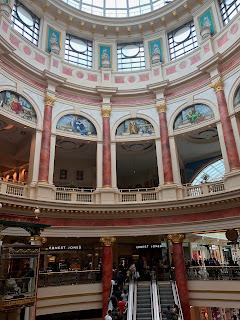 It was a reminder that the Trafford Centre was the last gasp of this kind of retail experience. A decade later, Liverpool One revitalised a city centre and redefined what a shopping mall should look like. Since then, the big developments - the Westfields in London, for example - have been in the middle of town, not isolated on the edge of the city. Right now in 2018 you can order anything you like and have it delivered to your door. If you're going to get up and go shopping, you want it to be somewhere a bit interesting and lively. You want to go into town. 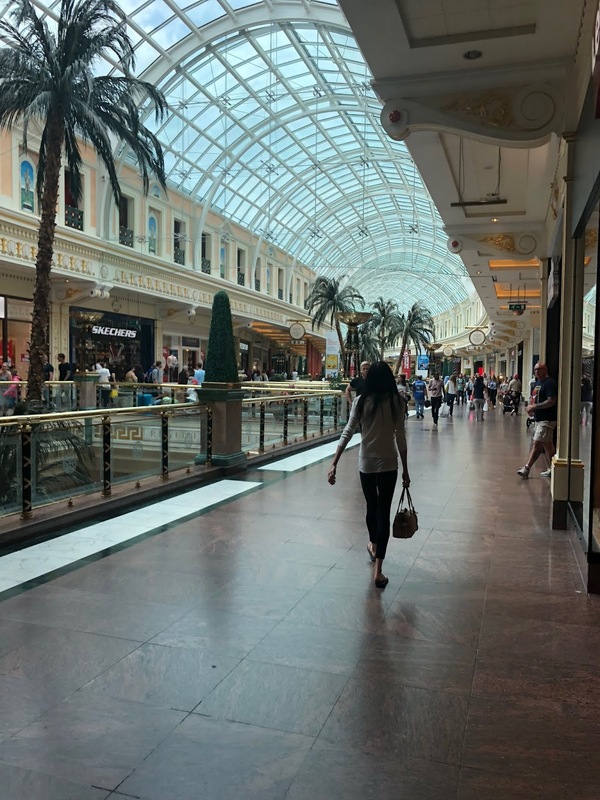 The Trafford Centre is still incredibly popular, of course, and it's always handy to have loads of free parking and plenty of shops close to one another. I did wonder, though: once the Trafford Park line is built, how many people will drive here to catch their tram into Manchester, or MediaCity, or Old Trafford? 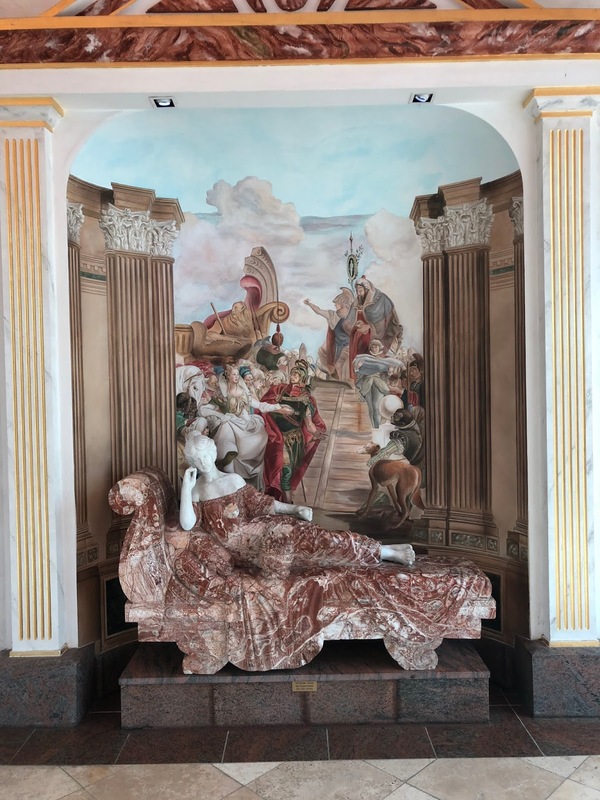 How many people will use this as one enormous, fake Baroque park and ride? 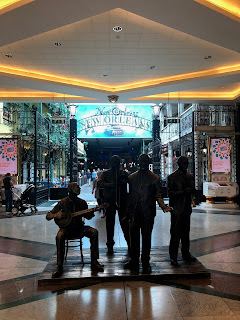 I headed back to New Orleans, past the car that belonged to the mother of the centre's first owner ("as a lasting tribute for all her support inspiration and guidance") and into the Wetherspoon's. 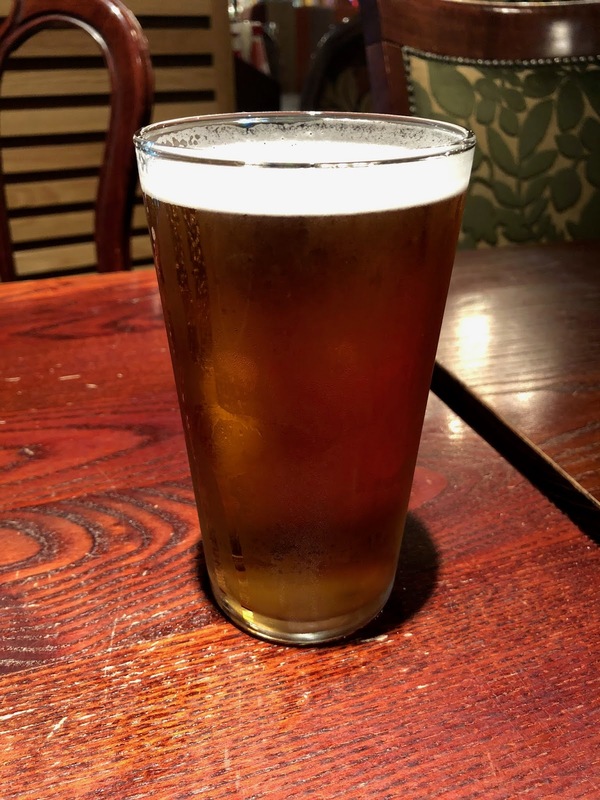 I know we should be boycotting them because they are owned by an absolutely horrible man, but the app that lets you order your drinks without going to the bar? Absolute genius. The Trafford Park line is due to open in 2020. I've seen where it's going. I don't think I'll need to go back. Apparently that Wetherspoons is unprofitable and due to close. So by visiting you are helping the ruin of Wetherspoons. Or something.